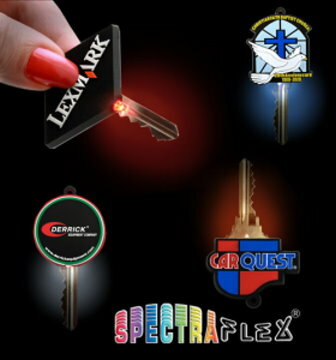 The amazing 1 1/4" X 1 1/2" LED Key Cover slips easily onto most any key and provides an ample and steady light for that most elusive keyhole. Available in LED light colors of Red, Green, Yellow, Blue or White. Great product for youth groups, incentive and safety programs and event giveaways. Provides a full color imprint area on both sides of the product in an area of 1 1/4". The minimum custom imprintable order is 250.